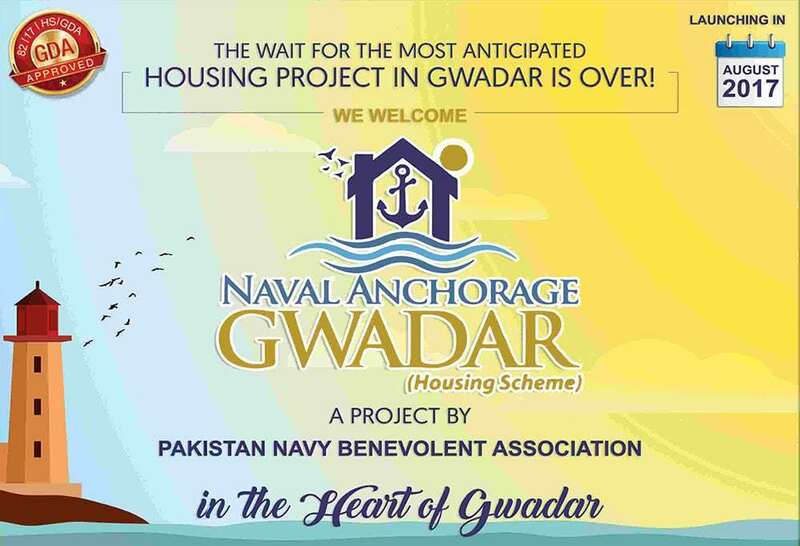 Naval Anchorage Gwadar in an upcoming housing scheme launched in the most alluring port city of Pakistan. In recent past Naval Anchorage has successfully delivered and accomplished its Housing Project in Islamabad Zone V on Islamabad Highway. In pursuance of comfortable living to its officers and men who dedicated their whole lives in serving and defending the Nation and mother land. It will also support the wards of those Shuhadas who sacrifice their lives on active duties. 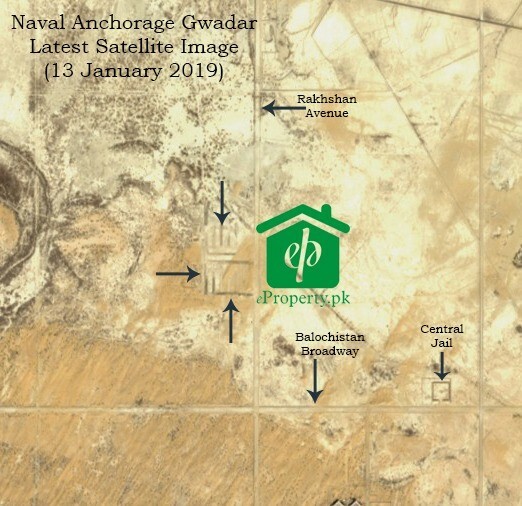 Naval Anchorage Gwadar will be one of the best Housing Scheme in Gwadar consisting of a peaceful, secure & environmental friendly atmosphere and will be matter of pride for its residents and members. NOC for the housing project has also been issued by GDA. It is located in Ankara Shumali on prime location close to new zero point at Gwadar Jiwani coastal highway. It is approximately 20 km from Gwadar port, 7 Km from Airport; 5 Km from Marine Drive. Naval Anchorage has 01 Km frontage on coastal highway and 01 Km on existing Rakhshan Avenue. Six main avenues/ boulevards as indicated in GDA master plan are crossing through the Anchorage land. Naval Anchorage land has also marked on GDA updated master plan map. Atif sb, what is your view of naval anchorage investment over 3-5years vs DHA Multan for the same time frame. If I can mature 2 plots, should I go for one each or both at any of one location ? Both are equally good, as City Multan is much more stable. Gwadar is underdeveloped city and its market more volatile as compare to Multan. atif bhai what are your expected developement charges in this scheme.. will it be same as the orignal amount, less or more? Similarly will it be only in installments or one time payment? Atif bhai how much will be the development charges according to your estimation?? Please suggest if this is a good time to invest in Naval Anchorage and new town phase 4 & 5??? What will be the turnover timeline ??? what will be the location of new town phase 5 ??? Do Naval Anchorage have any commercial options? Please advise as your post doesnot mention. Secondly is transfer possible from Lahore ? Please advise. 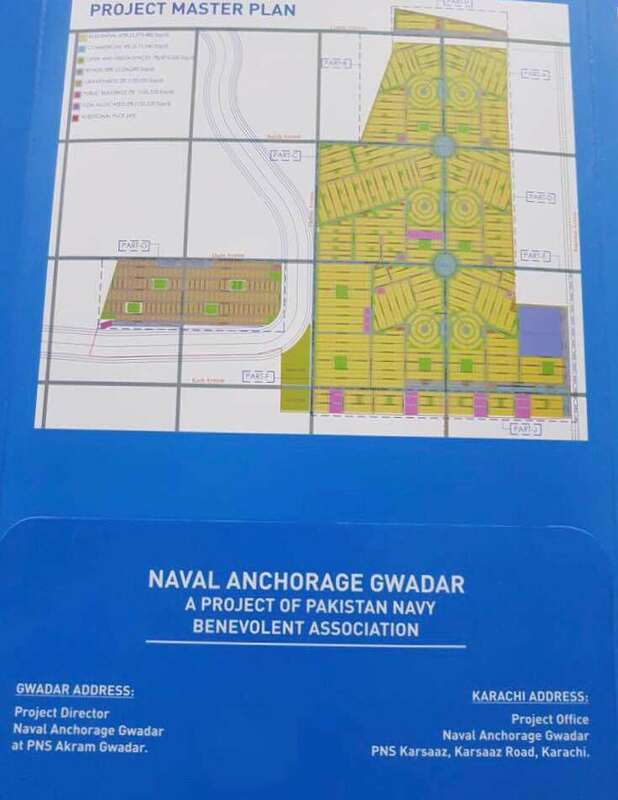 Currently only residential plots available for Naval Anchorage Gwadar. We get transfer in Gwadar, Karachi & Islamabad currently. We have requested them to open office in Lahore as well. But currently it is not possible to get transfer in Lahore. Atif bhai kindly suggest with 5 year holding plan what is best in naval anchorage 5 marla or 10 marla …. AOA Atif bahi, How come the same plot is being sold in 20 Lacs which is given by Naval Anchorage in 4800000 on installments? Can you please clarify this. I got 1 Kanal plot and already paid 3 installments. This is shocking to me if I can get same plot in 20 Lacs why should I pay 4800000. When Naval Anchorage booked plot at 48 lacs at that time cash file was being traded at 35 to 38 initially. Due to market depression in Gwadar and overall prices came down in Gwadar. Now these cash files are available in 20 lacs. That is the only reason. Otherwise there is no difference between both types. Sangar Phase 3, 1000 yards plot price was 85 to 95 lacs at that time, which is now available at 50 to 60 lacs. Market depression is the only reason. What is the file rate means? It is cost of land dues clear file. Atif Bhai what is meant by letter rate? 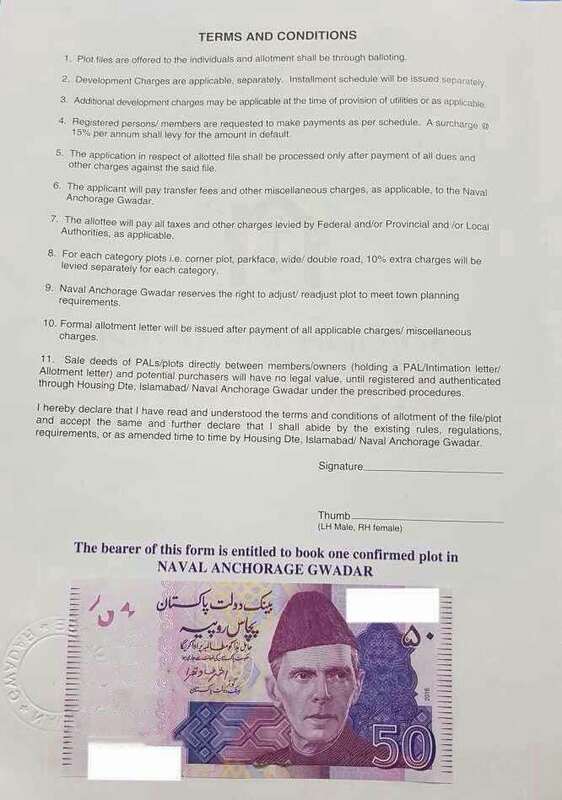 You are buying a transfer letter that is issued by Naval Anchorage Gwadar. It is like DHA allocation letter. Not dealing with Installment plan. 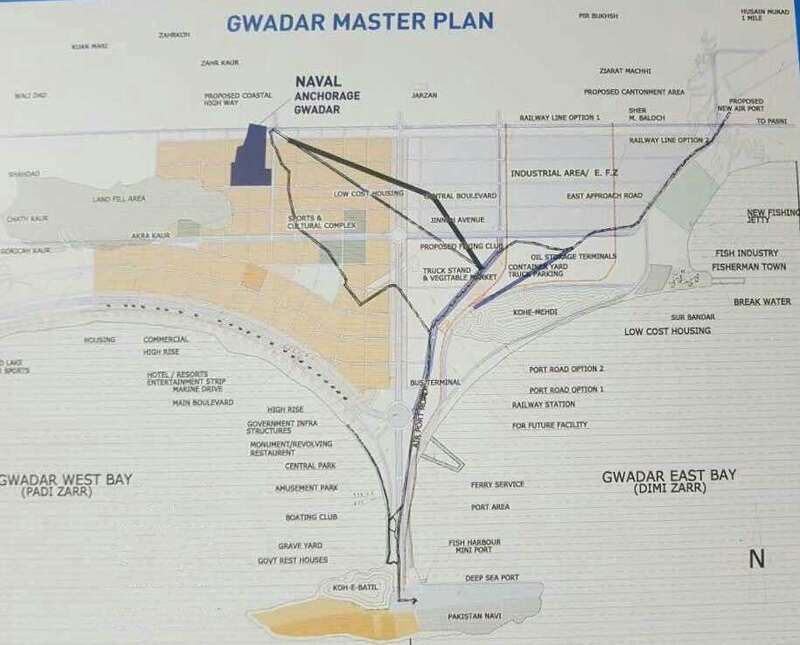 Will the price of Naval Anchorage gwadar files increase after launching of map/ master plan. Many people are reluctant to make any purchases before master plan. It is very much expected that after announcement of master plan prices will increase. Atif Bhai what you mean by 10 Marla file letter rate? Is it rate of full paid dealer quota file? It is full paid file against land, and also like allocation letter like DHA. Ok, it means it’s same file which was available on installments for 3 million. It means now available on half price. No, it is not installment file. It’s like DHA file which is already converted to allocation file. It mean the most safe and secure file. Infact I am not very familiar with terms allocation file etc . In simple words after payment of 14 Lacs you will get a plot when they will start process of handing over possession. No further payment needed. Is it the real scenario? No, it mean that cost of land is clear. After paying 14 lacs plus transfer fee, you will get this file transfer on your name. You will pay development charges when they demand. Development charges will be payable in installment plan. 1.Should we pay installment for 1 kanal? ?and buy very expensive file..
We in general first make decisions then ask for suggestions. One who has booked the file for Naval Anchorage, should not if was not able to pay the complete installment. I will again suggest all readers of this forum never ever book on installment if you are not able to pay the installment till end. Which investment is better, Installment Plan or Cash Payment? In fact one who has cash available, installment plan does not suit him. But one who dont have cash available he has no choice other then installment plan. Cash files were initially selling at 30 to 35 lacs at that time 48 lacs booking in installment was fine but now due to market condition cash file price came down and booking seems expensive now. So this vary from time to time while making comparison. Market may remain slow till new Govt. formulation. However if mean while cash file prices go up then installment plan of 48 lacs will be again looking fine. Apply for NDC/ NOC (with authorization letter/ power of attorney) at least 10 days before intended transfer date. Same will be processed/ approved in three working days. Submission of transfer documents 7 days before transfer date. Following documents to be submitted as transfer documents. Transfer of plot file will be conducted in the presence of both Seller and Purchaser on designated transfer days at Islamabad, Karachi & Gwadar as per convenience. Transfer will only be executed through Naval Anchorage Gwadar registered dealers as mentioned in the website. I have received official letter from naval anchorage after down payment. Is there any profit margin if I sale it now? It was a successful ground breaking ceremony of Naval Anchorage Gwadar yesterday at site. A video of complete ceremony will be shortly updated. Project is being booked for 3 years cost of land payment plan and then development charges will be started. In General developer offer development charges payment plan in installment as well like 3 years. So in total project time is 6 years. We need to give reasonable time to project to get a reasonable gain. However in short term market may go up and down mean while in these 6 years several times. In my opinion once development work started we will see stability in prices of Naval Anchorage, but as project time is 6 years so we should at least give it 6 years for hand some return. I bought 500 sq yards cash file in 29 lacs. I need to sell the cash file in my name what are the current rates and how much time i have to wait to get my rates. 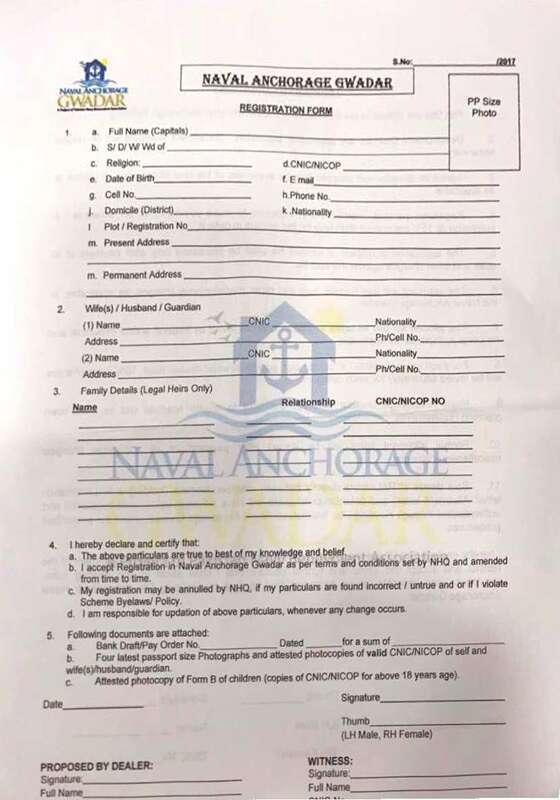 Have you receive your transfer / allocation letter from Naval Anchorage Gwadar? Yes i have the transfer in my name. Kindly advise current rates for 500 cash file. Salam, dear whats the price of 10 marla balloting file in naval anchorage gwader on 3-01-2018. Any idea when we need to pay the down payment. We did not get any information from Naval Anchorage team. Please contact Naval Anchorage office for further assistance. Salam, are files available of Gawadar Anchrage, if yes what is the rates of all sizes? Market asking for 1 Kanal Naval Anchorage are 23 to 24 lacs in cash payment. 24 lac profit or total ? We are getting calls from successful applicants for selling of plots. We at eProperty do not trade booking balloting files until down payment is made by successful application in addition with intimatiom / information letter received by Naval Anchorage. Once you have made down payment and received letter from Naval Anchorage please contact us for buying selling requirements. Naval Anchorage Gwadar balloting has been announced in next coming week of December 2017. According to the official website, Naval Anchorage Gwadar balloting will be held on December 05, 2017. Balloting ceremony will be conducted in Bahria Auditorium Karachi. Thank you for the information. I have been successful in 10 marla residential plot. Any further details regarding payment date of down payment and further installments? Second, what do you suggest for investing in Naval Anchorage. Is it worth to invest for holding period of 4 to 5 years? Please need your kind guidance.. Naval Anchorage will be a good investment for next 3 to 5 years holding time. Any update regarding Naval Anchorage Gwadar..Its almost 45 days I submitted application but still no any confirmation or email response from their side. Any idea regarding balloting date or other details..kindly share. There is no confirm ballot date available yet, but they are sending confirmation message to applicants for application receiving. Is it Government Scheme or Private? 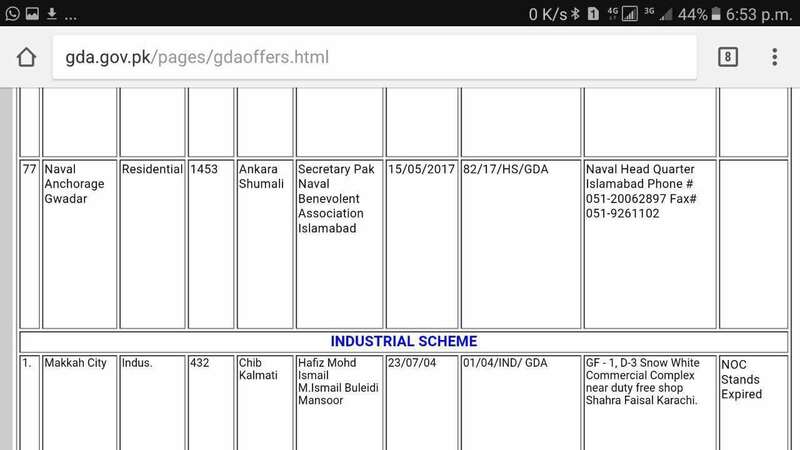 It is Navy Scheme, please contact Naval Headquarter Islamabad for further details. 2-if should invest in which size of category? 3-Is it good to invest in Residential plots in gawadar? 4-approx how many years investor has to wait for getting own ? 5-if an applicant succeed in balloting then he can sale his file in market are there customers available in market? 6- is there any other project in pakistan which will be fully secured and short term better then Naval Anchorage Gawadar? 6- There is Brand available in Gwadar yet that is fully secure (only one brand is 99.99% secure in Pakistan that is DHA). Naval Anchorage it self not a big brand, as per previous we only have 1 project in Islamabad for track record of Naval Anchorage. However once Naval deliver more then 5 projects in Pakistan then we consider its track record, we have only 1 example of Islamabad only. I hope you are doing well, You had replied (Mr. Umer) and the below point was very catchy can you please advise the project is the joint venture with any firm or not. As a normal person who is investing how he will come to know about this and my self is in the same category of people who do not know much. In Joint Venture risk increased, we have witnessed Joint Venture in Army / Navy backed projects previously. Bahria Town it self is an example of Joint Venture. Which later on case won by Malik Riaz and he is get the name Bahria Town. It was actually project of Pakistan Navy. Sir agar mujhy dicrtly whitout boloting k file chye to mil sakti hai? Dear atif iqbal bhai 5 or 10 marla also availbale ? 5 Marla and Marla are available on installment plan only. I need your expert opinion and analysis on this. 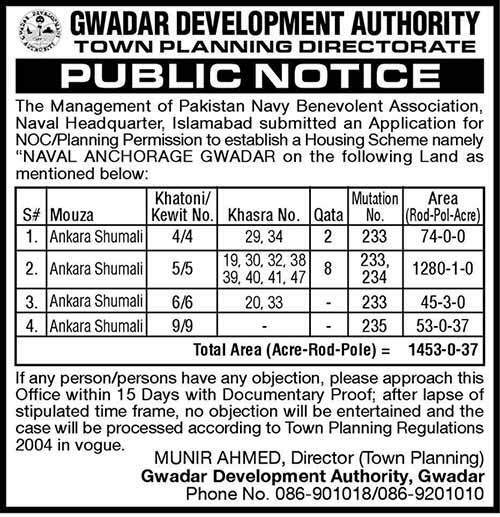 Whats your take on naval anchorage gawadar with respect to DHA multan in terms of applicants and own money. DHA Multan is much more secure brand. you mentioned this in web site,any specific reason???. Its all about luck, people got success full with one application only and get un successful with 100 applications even. Sir I just have to gather some information from you, my cousin is in China for last few years, if he sends his documents & passport copy to me in Pakistan can I deposit his forms here in Pakistan in Overseas quota? One more thing I want to confirm if one has only entry & exit stamps BUT he does not have the NICOP then how can he avail opportunity of overseas quota? He can applied while in overseas in overseas quota, he dont need NICOP if he has passport and valid visa. The thing which I want to ask, can I submit his application here in Pakistan, if he sends his documents to me in Pakistan and I submit these on his behalf . Or its mandatory that he has to apply from China?? You can apply from here, also contact number of Naval Head Quarter is given on our page. You may also contact them to clear further. Last date of form submission is not announced yet. At the moment wait and see. Only 1453 Acre total area, very rear chances of success in booking. But you can try luck if you want. 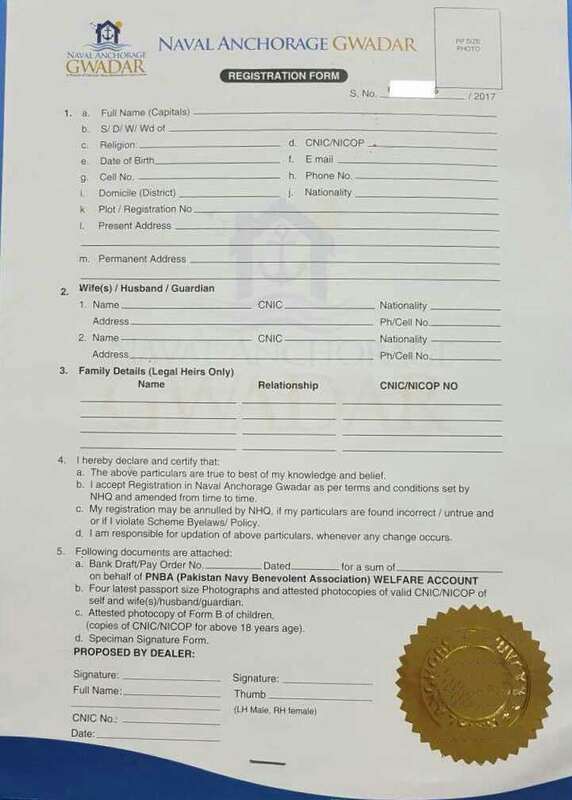 One more thing to confirm, my cousin is in China, can I deposit his Form in Pakistan on overseas quota? If he sends his documents to me & I submit his form it would be fine? sir please whear naval anchorage office in karachi ?plz tell me about deatal prise $ paymint . Do you recommend to invest in naval anchorage as they are offering plots in almost double price as compared to other societies. Like canadian city ….etc is it worth? What would you suggest canadian city, gawadar anchorage or DHA Multan. DHA Multan is much more stronger as compare Naval Anchorage or Canadian City. We are observing public response against Naval Anchorage Launch, at the moment we should wait and see the market trend. I just came to know that projet is going to launch within this month and price will rise soon as the name NAVY is attached for developement. Sir what’s recent update about naval anchorage Gwadar? We are waiting for official launch. any update regarding the Naval anchorage Launching ??? It is launched on 19th August. Sir as the project has been officially launched by now, what information is available regarding the booking & payment plan etc. . .
We are waiting for official information, on their website there is no information available regarding Naval Anchorage Gwadar. At the moment there no official booing prices available, tomorrow booking plan will be available. Sir as booking plan & prices have been outlined in today’s newspaper, What’s yours assessment about it now? To me it seems that rates are too high according to location & Gawadar, What’s yours final opinion? We are also observing public response against launch, there is no final recommendation yet, wait and see policy. Please contact any local area agent who has info about local market, I don’t have any information about the projects. is it worthy investing in dha Multan? Please contact once transfer open for DHA Multan. Before opening of transfer it do not worth buying in DHA Multan. Interested. Any idea about launching price and payment plan? We are waiting for official launch, once officially launch all information will be shared here, please bookmark this page for future updates about Naval Anchorage Gwadar. Only strong factor is that it is name of Navy with it, other wise location is far away from current population. It may take time to develop. Price is also high and on cash payment. Would you recommend to invest in the project? Naval Anchorage is not officially launched and we are not aware about prices. We are waiting for official launch and official prices to see location vs. price justification analysis with brand name Naval Anchorage. We have talk to Uprise in Karachi who claim their official sellers, they told that project will be launched after 15th of July with official price plan, we will wait for it before any recommendations. It was shared in social media but not sure that it is official advertisement or made by some of their agent(s). 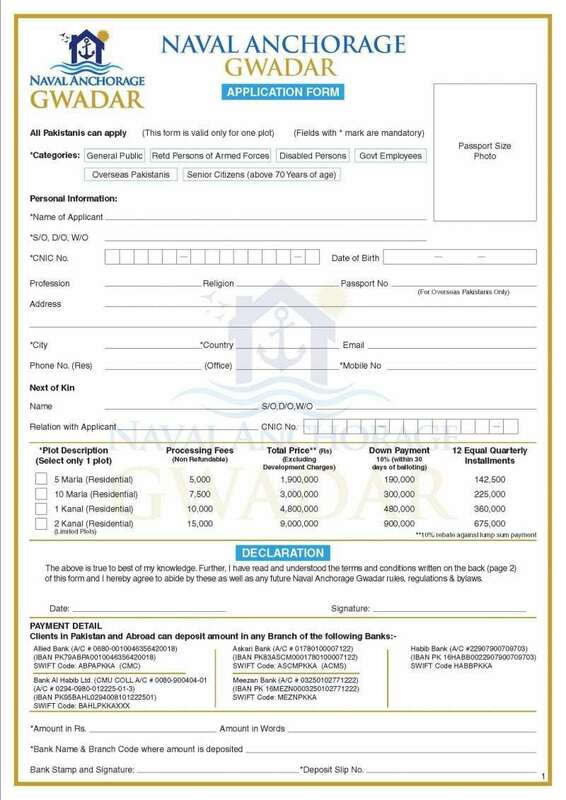 Following booking form is being in social media for Naval Anchorage Gwadar. As eProperty has already advised to wait for official public launch through National News Paper (s). 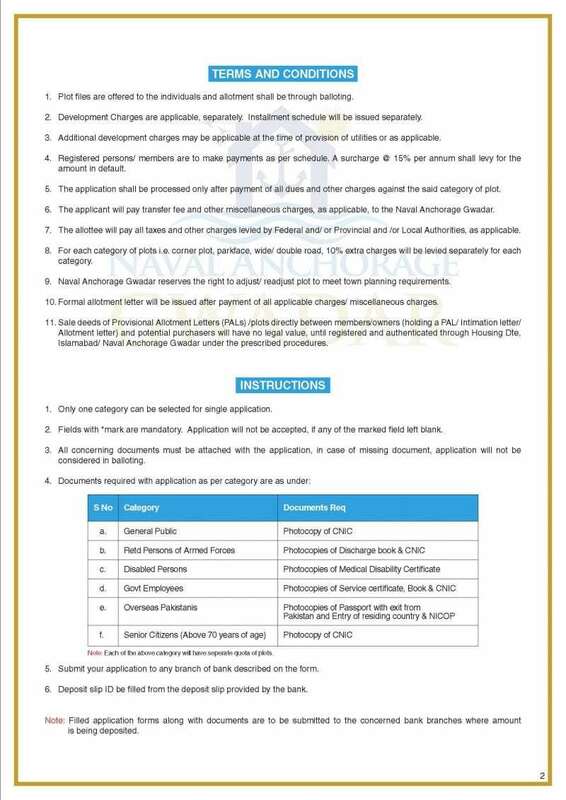 In market some people are sharing that NOC is granted for Naval Anchorage Gwadar, however GDA official website is not showing any project name “Naval Anchorage” in their approved list. It is to informed in public interest please do wait for official announcement for booking made publicly. Before any public announcement is made please avoid any kind pre-booking. eProperty do not recommend any kind of such booking to secure best of public interest. At the moment official launch is not done. People are trying to sell in pre launch. We recommend not to buy any thing in pre launch to be secure. Once it is will be officially launched with price and schedule we will update here. Once NOC issued and officially launched under the umbrella of NAVY then what’s your recommendation to buy. What about location and developers, do you know them how is the credibility. I am not aware about the location. I only prefer DHA in bookings for others I better wait and see once things are define then I start dealings. At the moment location is not clear to me and also not the schedule. The location is Mouza Ankara Shumali on Rakhshan Avenue. Plot size 500 sq yards, price PKR 35 lacs + own. It’s Pakistan Navy project which is the most secure and will be a profitable deal. I am not an agent and i highly recommend investment here. All Islamabad plots listed in navalanchorage.com are above 60 lacs i see Gwadar the same. 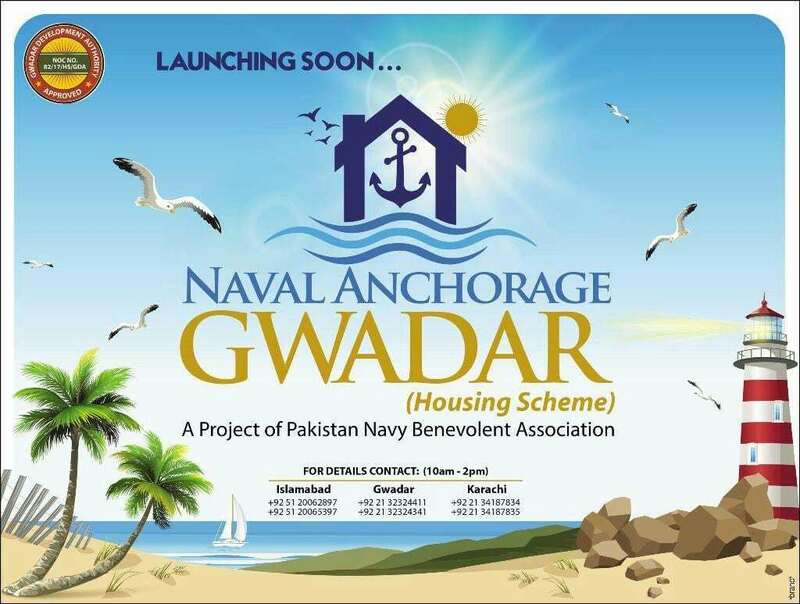 Atif bhai some dealers are offering pre launch booking of Naval Anchorage Gwadar. They are saying that they can get better price on pre launch. What do you recommend? I do not recommend any booking or buying till official release. Please wait for Naval Anchorage officially announced booking for public. I believe these dealers are offering best of their faith. But I think that such practice from buyer side is not recommended. We should wait for Official Launch of the project. I will highly recommend to wait and not to give any token money to any one before it is officially launched and booking schedule is publicly advertised along with payment time etc and other terms and conditions. 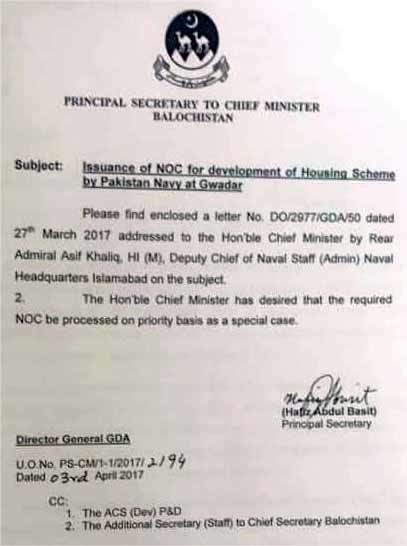 Pakistan Navy submitted application or NOC / Planning Permission Naval Anchorage Gwadar in Shumali Ankara for 1453 Acre approx.